A Great Day at the Office provides the perfect remedy for those who can find themselves feeling exhausted or overwhelmed by work. 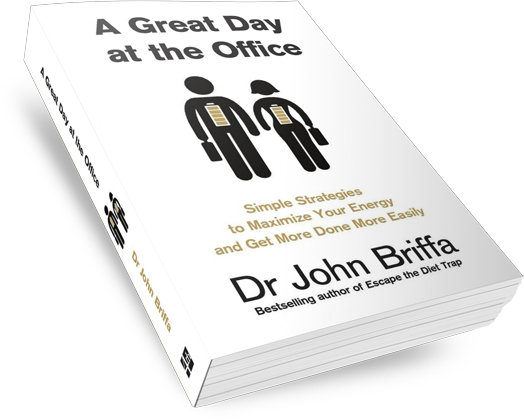 In this ground-breaking and timely book, Dr John Briffa reveals a range of deceptively simple strategies for restoring vitality and maximizing energy – taking performance, productivity and sustainability to new heights. Drawing on cutting-edge research, as well as the author’s real-world experience with more than 10,000 clients and business professionals, A Great Day at the Office equips readers with the knowledge and practical know-how required to run their body and brain at maximum capacity. A Great Day at the Office offers key insights and practical guidance on all the factors that drive our energy and effectiveness including diet, physical activity, light exposure, breathing, sound, psychology and sleep. Individuals who put even a fraction of the advice offered in this book into practice stand to be rewarded with an energy and vitality that enables them to get more done, more easily – both in and out of the workplace. 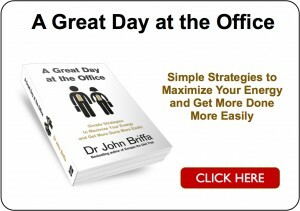 Read the Introduction to A Great Day at the Office. The crucial dietary tactic that ensures sustained levels of energy throughout the day with no ‘mid-afternoon slump’. The common but under-recognized causes of insomnia, and how to get the sort of deep, restful sleep that leaves us fully revived in the morning. The evidence that dehydration drains vitality and brainpower, and the single best guide to whether our fluid needs are being met. Three practical strategies for reducing alcohol intake quite automatically and without feelings of sacrifice or deprivation. How certain types of music and sound can boost mood, mental performance and immune functioning. The simple breathing exercise that can induce a state of calm and focus in just a few seconds. How to maintain health and fitness in as time-efficient a way as possible, and without the need for a gym or exhausting exercise. How to use light technology to optimise our sleep, mental functioning and mood. The three simple psychological strategies that harmonise our body and mind and put us in a highly resourceful state. The mental ‘trick’ for banishing bad habits and establishing healthy ones – with ease. Food provides us with fuel, and what we choose to eat can determine whether we are highly energised and raring to go, or feeling as though we’re wading through treacle. The first half of the opening chapter explores the science of the conversion of food into energy, and how to eat to ensure sustained levels of vitality throughout the day. Most of us have an eye on the long term too, so the second half of this chapter conducts an evidence-based examination of how to eat in a way that aids our personal sustainability. Here, you will learn which foods are best for staving off health issues such as weight gain, heart disease and diabetes. The final part of the chapter provides practical guidance on how to put all this theory into practice. If you’re imagining that this chapter is all about bran-based breakfast cereals, skinless chicken breasts and low-fat spreads, then you’re in for a treat. As the research reveals, most conventional nutritional ‘wisdom’ is fundamentally flawed. Using up-to-date science (and a healthy dose of common sense), the chapter clears up dietary confusion and puts a slew of nutritional myths to bed. Read this chapter to learn why ‘healthy eating’ may actually be holding you back, and how to release yourself to a state of optimal energy and wellbeing, with ease. Ensuring peak performance is not just about what we eat, but also what we drink. In this chapter, we explore the critical importance of hydration, and reveal the single best guide to whether your needs are being met here or not. This chapter examines the health aspects of not just water, but also soft drinks, fruit juice, smoothies, coconut water, coffee and tea. The chapter ends with an assessment of alcohol’s influence on wellbeing. 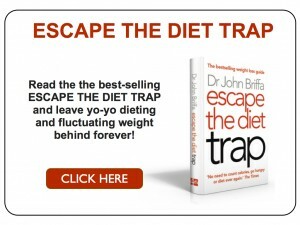 Here, you will also discover three deceptively simple strategies that often lead to dramatic reductions in alcohol intake, but without the need for conscious restriction or feelings of deprivation. As withadvice regarding what to eat, recommendations regarding when and how often we should eat are prone to mixed messages. Traditionally, three square meals a day has been advocated, though in recent times there has been a vogue for ‘intermittent fasting’ – the practice of consuming very little on certain days, or going for extended periods of time without eating. In contrast, others recommend eating frequent, small meals as the best way to maintain energy and effectiveness. This chapter examines the benefits and pitfalls of different eating patterns and provides guidance on how to ensure the optimal feeding strategy for you. For some, sleep can seem like ‘unproductive time’, and will often relegate it in favour of work and other endeavours. Research shows, however, that not only does sleep prepare the body physiologically and psychologically for the next day, it promotes better health and even assists weight control. This chapter explores how scrimping on sleep can cause our energy levels, performance and wellbeing to suffer. It also offers a range of simplebut highly effective strategies for ensuring the sort of deep, restful sleep that leaves us feeling properly revived and ready-for-action each morning. Most of us don’t usually think of light as a lifestyle factor but, as this chapter reveals, it can play a vitally important role in how we feel and function. The chapter starts with an exploration of light’s impact on mood and mental functioning, and the practical steps we can take to make full use of this natural commodity, particularly in the winter. This chapter also reviews the value of sunlight regarding physical health and wellbeing, specifically through its ability to stimulate the production of vitamin D in the skin. We will see how this nutrient is linked with protection from a wide range of health issues and conditions including heart disease and several different forms of cancer. The chapter ends with advice about how to use ‘safe tanning’ and supplementation of vitamin D for optimisation of health and wellness in the long term. We’ve all heard that exercise is good for us, but some can nonetheless struggle to find the time to ‘fit it in’. This chapter looks at how we can meet our needs for physical activity in as practical and time-efficient a way as possible. The chapter starts by exploring the benefits to be had from incorporating walking into our lives, and provides everyday guidance here. The importance of resistance exercise is also highlighted, and the chapter outlines a briefbut effective routine that requires venturing no further than your home or hotel room. For those who are already active and looking for something more advanced, this chapter also discusses ‘high intensity intermittent exercise’ – a form of physical training that offers significant benefits for health and fitness, but with relatively small time investment. Many people will know what it’s like to have a favourite song boost their mood and put a spring in their step. This chapter explores the scientific basis for this phenomenon, as well as how something as simple and enjoyable as listening to music may improve our wellbeing and performance, both in and outside work. This section also introduces a technology known as ‘binaural beats’ – the playing of specific frequencies of sound into the ears to induce desired states such as mental focus or relaxation. Breathing is one of those bodily processes we tend to take for granted. This chapter reveals, though, that many of us can breathe quite inefficiently from time to time, and how this can impair our energy and mental functioning. The chapter also provides practical guidance on breathing techniques that can calm the mind, optimise our physical and mental state, and promote general good health over time. Our success depends not just on balancing and optimising our physiology, but also our psychology. Unfortunately, we can sometimes get caught in negative thought patterns that may block our mental processes, creativity and inspiration. In this chapter, we explore some simple and effective tools for changing our thinking in ways that can very quickly boost our mood, brain functioning and productivity. Specifically, this chapter explores the research that shows that the key to mastering our mind can often be to focus on another organ entirely – the heart. This book offers a range of highly effective strategies for boosting energy, productivity and sustainability. But, many of us can sometimes resist things we know that are good for us, and may persist with things that we know are holding us back. This final chapter show how motivation is the key to changing behaviour, and reveals a way of thinking that makes good habits stick (and bad habits easy to break) – for good.